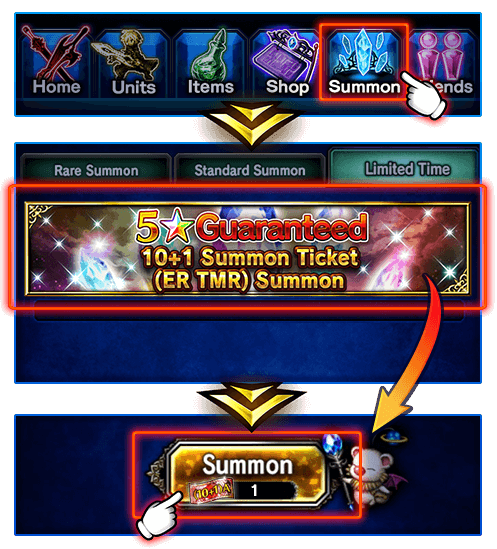 Head over to the Summon screen, select the Limited Time tab, and tap on the 5★ Guaranteed 10+1 Summon Ticket (ER TMR) Summon banner. Getting desperate gumi ? Nobody giving you money anymore ? Kuuro and lupinorris like this. Bet it is only 49.99 and Marie is 95percent summon chance. I'm probably the only person that would love this summon pool. 3 Marie, 3 kurasame, no seig. I couldn't lose.... if it was a lapis pull I'd do it. 21er, Polka! and aa25 like this. Once you buy Lapis your account gets flagged up as P2P and gumi will mess with your Rainbow rate. F2P on the other hand gets rainbows from dailies. It’s all maths and stats. Casino wins. Don’t get lured in. Ophiel and Kiramon like this. I'm with you. 3x Marie, 3x Kurasame, and 2x Sieg. It's an Elemental Resist TMR banner and her Rainbow Robe does that quite well. I predict this will be at least $47.99. edit: If this were a free ticket I'd hop all over the chance...0 Marie, 0 Sieg, 7* Kurasame. It's crazy to ME think that I could take my entire family (wife & 4 kids) out for dinner (twice if we cheap it up!) for the amount charged for a chance at some pixels. THAT is what keeps me from spending on this game. edit 2: If you have the money and spending it brings you happiness without harm then go for it friend. This is my take on my own situation, not a judgement of anyone elses. VexHaus, Regalia, Sorwen and 1 other person like this. Bold claim for someone without maths or stats. It's crazy to think that I could take my entire family (wife & 4 kids) out for dinner (twice if we cheap it up!) for the amount charged for a chance at some pixels. THAT is what keeps me from spending on this game. Imagine if you bought a pack of cold ones for just yourself instead. That's a lot of cold ones. Join us next time for "Luck would be luck if computers could be random" or "It all failed because of the seed". Well, it seems to work out for Gumi, or they would probably adjust the prices? But I am in the same boat as you. I would generally be willing to drop a bit of money on this game, as I am quite enjoying it. But with their pricing any temptation I might have at some point immediately flies out of the window when I see how little you get for the same amount as a full-price videogame.